Talk about pampering our pets lately! 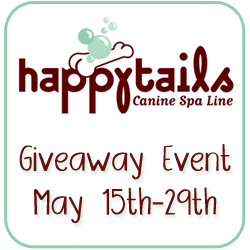 This is the grand prize giveaway for $100 to HappyTailsSpa for your doggies hosted by Two Little Cavaliers. And, don't forget to enter to win the Dog Smog and Sparkle & Shine Shampoo that WOS reviewed here too. Enter on the Rafflecopter form below from May 15 12:01AM EST to May 30 11:59PM. Open to US, 18+. Good luck! Please take the time to enter my other giveaways while you're here. Disclaimer: Please view my full disclosure. Winner will be announced by Two Little Cavaliers. Promoters of the event, with the exception of the host, are allowed to enter the grand prize giveaway. Dental wipes for my dogs dirty teeth.